I recently posted a question on Facebook, wondering who, if anyone, likes to include macaroni and cheese as part of a holiday turkey dinner. I was AMAZED at the response! Some people, like my friend Kyrus, said that "in his house this is not even a question." Susan said that it's a staple in all of her family's holiday meals. CJ simply stated that there's no wrong time for mac n cheese. Debbie was just amazed at the amount of comments that this question generated. I guess people are very passionate when it comes to macaroni and cheese! 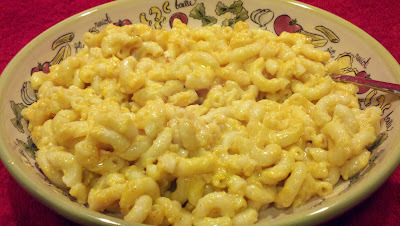 Now, I know I already have a few recipes for macaroni and cheese, but more is more, right? And since I recently saw Paula Deen making this on her show, I figured, why not?? It's really simple to make, and it always hits the spot if you're looking for some comfort food, or for a holiday meal! In slow cooker, combine cheese mixture and add the eggs, sour cream, soup, salt, milk, mustard and pepper. Add the drained macaroni and stir again. I used regular brown mustard instead of the dry mustard, just because it's what I had on hand. The main point is to add some kind of mustard because it makes it taste cheesier. If you're not a fan of adding eggs to your mac n cheese, you can simply omit them.